Infinite Cooling, a company that has developed a technology to capture and reuse water evaporating from cooling towers at power plans, was one of two local startups to be named a $100K Diamond Winner at the MassChallenge Awards which took place Oct. 17 at the Boston Convention and Exhibition Center. Co-founders Kripa Varanasi, associate professor of mechanical engineering, and postdocs Maher Damak PhD ’18 and Karim Khalil PhD ’18 accepted the award along with COO Derek Warnick. MassChallenge is a non-profit organization the supports and connects entrepreneurs and startups. Now in its ninth year, the MassChallenge Awards highlight up-and-coming startups in the Boston area. At the event last week, $1 million in prizes were given to startups with the most potential for impact. Infinite Cooling was one of the more than 150 startups spotlighted at the event. 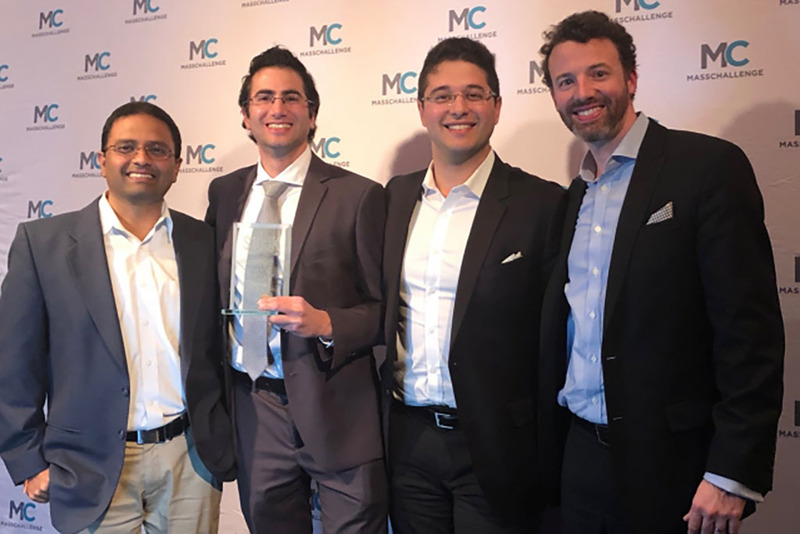 “Receiving the top prize at the MassChallenge Awards was an incredible honor for the Infinite Cooling team and will greatly help us towards our commercialization goals for the technology and solve a major problem at the Energy-Water nexus,” adds Varanasi. The technology behind Infinite Cooling has the potential to substantially reduce the water consumption by power plants and even provide a low-cost source of drinking water. “Our system can very efficiently capture the plumes that would normally be released into the atmosphere through cooling towers at power plants. By recycling this water we provide significant water savings for the power plant and community,” says Damak. “Our device not only reduces water consumption at power plants, it also reduces costly water-treatment requirements since the recondensed water droplets are pure,” explains Khalil. This clean water could be used for drinking water or recycled for pure water uses at the power plant itself. Since power plants are one of the largest users of freshwater — about 39 percent of freshwater is ear marked for power plants in the U.S. alone — Infinite Cooling’s technology holds the potential to make a massive impact on water and resource conservation. Their research was supported in part by the Tata Center for Technology and Design, and the prototype was supported, in part, by the Office of Sustainability and is currently being tested at MIT’s Central Utility Plant.